"In Search of Spring" is what I am after. 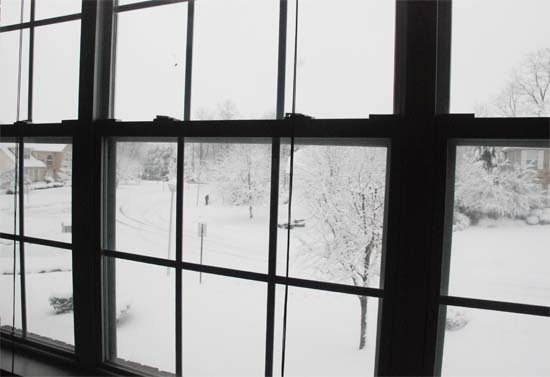 And after what seems like ages, this weekend did bring a weather where I was not under the illusion, regarding our relocation to the North Pole. "Are we moving to North pole or are we not?" 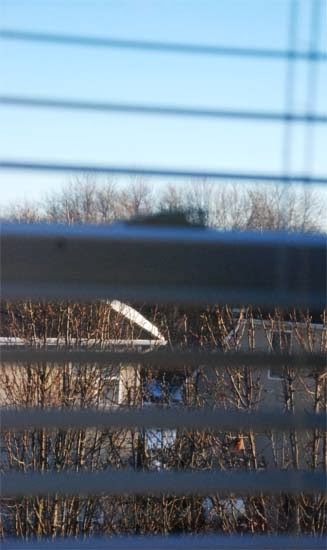 And if you squint your eyes and peer at this picture, you will even see a robin in those bare branches. And see the snow is melting off those roofs. Maybe we are not at 90.0000° N, 0.0000° W after all. Since my rants about the weather in every post might seem a tad boring,let me give a positive spin to this whole snow storm thing. Though on the onset this whole pile of snow, piling over with each storm, might sound like a bad thing, it has its own advantages. Like it renders driving around to fulfill "life's necessities" unnecessary. This means you get a lot of time to realize how unnecessary those necessities really are. This meant that I could spend two whole days, holed up, doing nothing but drinking tea and finishing "Gone Girl". 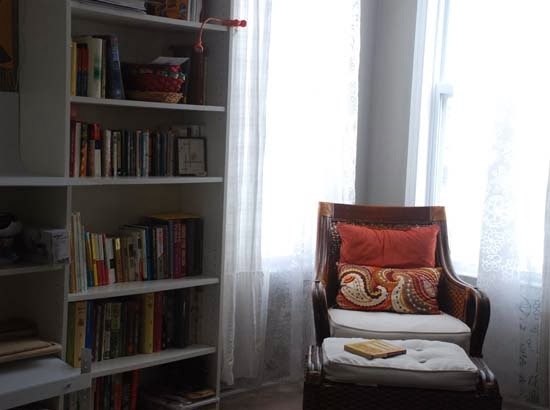 I could also spruce up the study and bring some order to the chaos of what is called crayons, markers, glues and other crafty stuff. And then when the roads were deemed fit, I could go to IKEA to get these orange clamp lights which I think is one of life's necessities.As is IKEA. This corner reminds me of friends who have moved continents and are enjoying warm weather while we freeze. They are missing all the fun. Add some minced coriander leaves to the prepared mix.Use this speedy salsa for the soup. Heat 2 tsp Olive Oil in a deep, heavy pan. Add a pinch of red chilli powder and about 1/2 tsp of cumin seeds to the oil and let them briefly sizzle. When the cumin sizzles, add chopped onion(half of a medium sized onion) and fry till soft. Now add your salsa. If you don't have the home made salsa, open a store bought jar. If you like it hot add chili powder or use a HOT salsa. 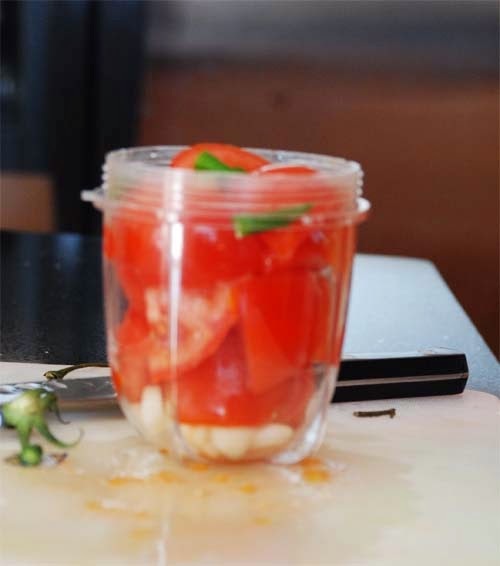 Cook the salsa for couple of minutes, stirring constantly so that it does not burn or stick. Note: I prefer using canned beans for this soup and I almost always skip the corn. 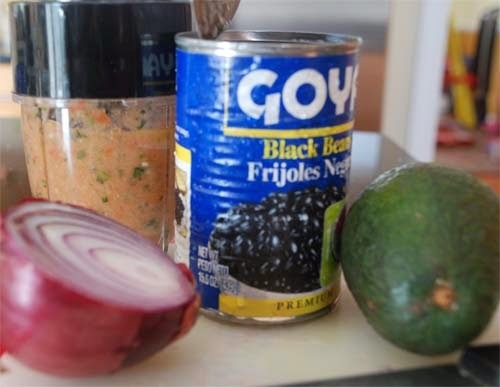 If you are using dried black beans, I suggest, you soak the beans overnight and cook them before adding to soup. Bring this soup to a full boil and reduce heat to medium low. Squeeze in a few drops of lime.Simmer the salsa soup until the corn/bean is completely cooked. For me this happens quick as I always used canned beans. Turn off heat and stir in a bunch of chopped cilantro. 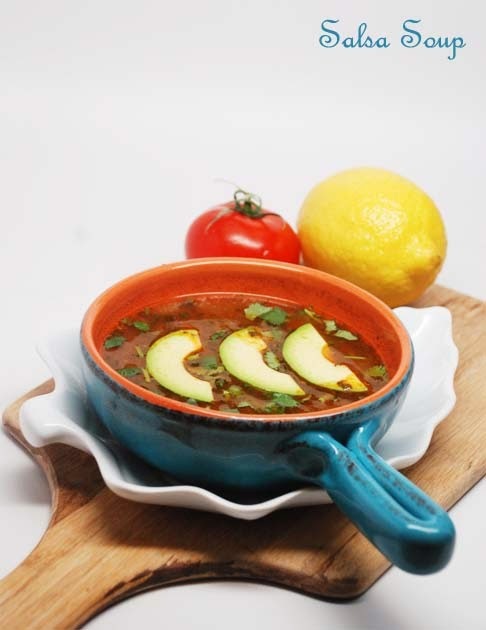 Ladle your finished salsa soup into individual soup bowls. Top with avocado chunks and toss a bit of cheese on top of that. I don't add any cheese as we like this soup light. Top with a few tortilla chips or papad instead of croutons. Everyone who reads this blog, probably knows Monica Bhide. She is a very successful food writer with many books to her name. While her recipes are no doubt lip-smackingly delicious, what I like best is her writing. Her website describes her as "A storyteller at heart" and I can agree no less. To know more about her, you can read her bio. Now, all of you know that today is Valentines' Day. It is a day after my own heart and I love the idea of cute teddy bears holding on to chocolates and hearts for dear life. Okay, just kidding, I love no such thing. 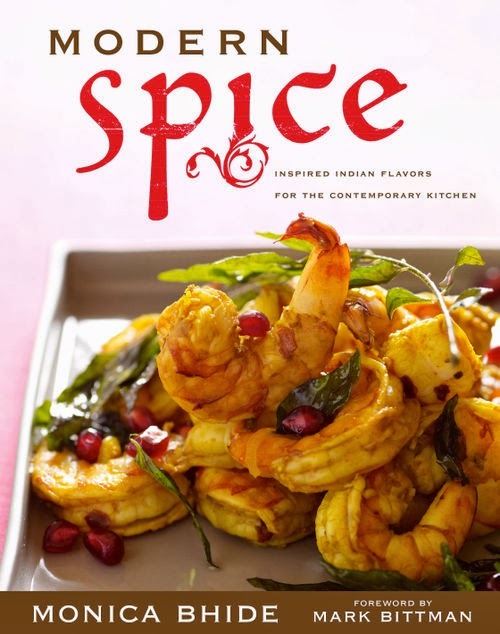 So, to distract you from a bunch of over-priced red roses or diamond hearts or even teddies, I have decided to give away a copy of Monica Bhide's book "Modern Spice" to one lucky reader of this blog. After all, there is no love greater than the love of food. And after all, I love you all so much. To take part, leave a comment on this post, saying "what is your favorite spice and how you use it" and yes, don't forget to mention your e-mail id. And here is a conversation with Monica Bhide which I had over e-mail. 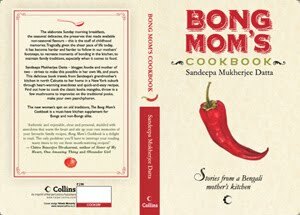 Monica, I always find your story of changing careers from engineer to food writer very interesting. How did it all happen ? Little of the back story please. Like many Indian immigrants, I came to the US to study. I earned two Masters' degrees and worked for a Big Six consulting company for a long time. The job paid well into the six-figures and I really loved the people I worked with but somehow at the end of the day, it felt as though something was missing. I kept feeling like I was placed on this earth to do something other than, say, leadership training! Mind you, not that there is anything wrong with that, it was just not my life's calling. Then, out of the blue, a very dear friend of mine passed away. She was only 35 and it really shook me to the core. It was a devastating loss and also a reminder of how short and fragile and precious life is. Her death made me rethink my whole life. So one day, I went in and quit. I gave up my engineering career to pursue my calling to tell stories. When you took the courage to change your career, did you face any setbacks ? How did you overcome them ? It wasnt really courage. It was not an option. I felt as though a part of my spirit was dying each day and I had to change something if I wanted to feel alive again. There were setbacks, there always are, but I think the key was to focus on the goal and not the obstacles. There were days that I would worry so much about how I would make this new career work, I lost so much sleep over how I would make money. It was a long time before I realized that all I could really do, all I could really control was my work. I had to work and write and keep writing. Eventually, the obstacles would take care of themselves. Do you apply your scientific and engineering skills in your creative career too ? How? I get in trouble when I do this! It works great for the how-to stories but I have to leave that part of my brain behind when I am writing essays. My agent always makes fun of me-- he says he can see the engineer come forth when I am outlining a book, and then disappear when I begin to write and the writer takes over! You are an acclaimed writer with several books in your name and so clearly you are a success. But what is your advise to the food writers starting out ? Is it wise for them to give up their day job to pursue a career in writing ? Ah, the million dollar question -- giving up the day job! I really dont know how to answer that one since everyone's circumstances are so different. In my case, we had saved up and I had a very supportive spouse who was willing to support me while I tried to find my legs in this new business. It is a tough choice and I think it is best to sit down and really make an educated, informed decision. Do you have any pearls of wisdom to share with us food bloggers ? Write daily, write consistently, write because you love to write and never, ever, ever give up. Of all that you have written, pick a favorite. Today if you happen to meet your 20 old self, what would you tell her ? Unlike where I live amidst snow, bitter cold and temperature dropping to negative, winter is a joyous time in the plains of Bengal. Because it is not really "cold" cold but merely a delusion of being "cold". Also this is the season when it is not really hot and you are not sweating at the mere prospect of a bus ride. That is a lot of "not"s. In fact winter is so pleasant that you can wear a sweater or wrap a shawl or sit in the sun after a bath in a bucket of water warmed by the same sun and yet not lose an ounce of body fluid by perspiration. Of course this luxury is only for the plains and the lower range of Himalayas in the far north of the state get severely cold and suffer from a case of proper winter. But we will not talk of severe winters as they are not as fun as the mild ones. So in the plains of Bengal, winter is the season to show off napthalene scented Kashmiri shawls and to indulge in heavy eating. Not that the other seasons see any less of the last bit but Bengalis love to think that a cold weather demands more of fatty food, sweet desserts and variety of dishes made with fresh vegetables like cauliflower, sweet peas and carrots which grace the markets only in the months of December and January. Okay, okay, now you do get these vegetables around the year but even then you cannot deny the pleasure of aloo-phulkopi chingri'r dalna, narkel-khejur gur pur diye pati shapta, piyaajkoli diye maach and beet-gajor er chechki on a winter afternoon which has the prospect of a nap under sun soaked quilt later. The erudite Bangalis also believe(and rightly so!) that the umpteen cups of hot tea or coffee gulped down to abate the so-called-cold, needs to be served with some deep fried deliciousness on the side. So, croquettes are fried, stuffed kochuris are rolled out and battered fish sizzle in a kadhai full of oil. Now, though it is the Egg Roll, Fish Fry, Chicken Kobiraji, Beguni and Aloor Chop which are the more famous deep fried snacks, there are several humble counterparts that are made at home with minimal effort and with ingredients easily found in a home pantry. "Chire Bhaja" or "Crisp Fried Poha" or "Crispy Beaten Rice" tops the chart in that category. It was the most frequent snack made by Ma, winter or no winter and especially on the arrival of an impromptu guest for cha. And guests were almost always impromptu in those times. Like most mothers of that generation, my Ma believed in the code of conduct set by the ancient Sanskrit verse "Atithi Devo Bhavah" which means "A guest is like God". Translated it meant -- "it is necessary to ply all guests with food and beverage irrespective of their desire to consume food". In summer this meant sherbet, sondesh and mangoes and when the weather turned cooler it was always tea and fried goodies. Since we lived in a small town, where getting shingara and mishti from the stores was as long winded as placing a telephone call, Ma always served something made at home. It could be nimki, which she would make by jarfuls every few months, or home made sabu papad and chips, which were made in winter. Most of the time those jars would be emptied by us, without her knowing, and so she had to resort to the default choice of "Chire Bhaja" on many a evenings. It was quick, easy and inexpensive. All it needed was chire or beaten rice which was a pantry staple, raw peanuts and gallons of oil. Heat enough oil in a kadhai --> fry the peanuts and remove--then fry the chire in a kadhai full of oil until those flat dry pieces puff up snowy and crisp. Simple. 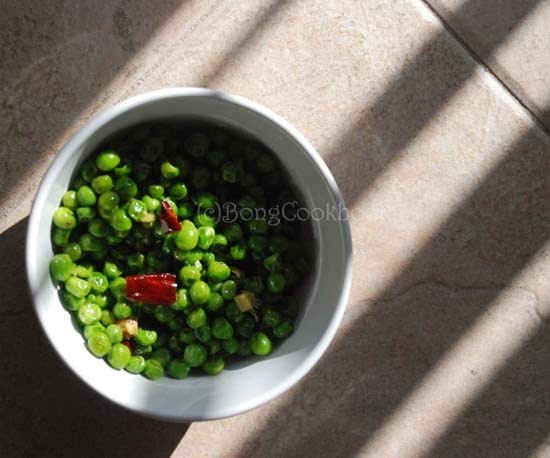 During winter when the sweet peas were a plenty and Ma already had some shelled peas at hand, she would throw in boiled and lightly sauteed peas with the chire bhaja. That Koraishuti diye Chire Bhaja was my favorite. 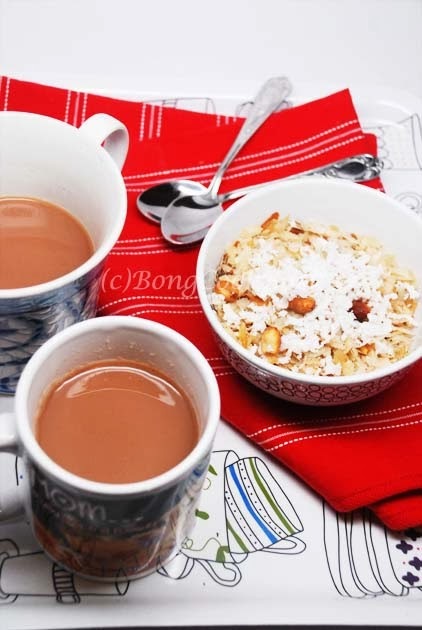 Sometimes if she had left over grated coconut after the pati shapta stuffing was done, she would mix the fluffy, soft "narkel kora" with the fried chire and sprinkle a little sugar on it. That gave the savory chire bhaja a sweet undertone which instantly took my fancy. 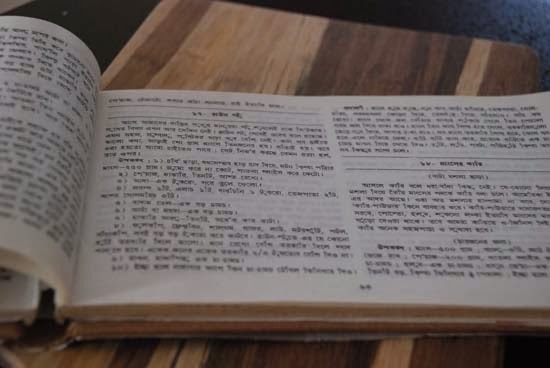 The dregs of sugar and salt mixed with the oil at the bottom of the bowl was a delight to lick and it was perfectly ok to wipe down those oily fingers on the pleats of skirts or the sari, whichever was easily available. Oil, then was not a bad word. Chire Bhaja needs to be fed oil. Period. But now, it is the oil which makes me freak out every time I have to fry chire. The result, I would rarely make chire bhaja, hyperventilating at the memories of oil stained fingers until my Ma-in-law showed me a less oily way to fry this stuff. She would first dry roast the chire in a kadhai and only then fry it in oil. This step cut down the oil dramatically. The chire turned crispy even with very less oil. Voila !! A trick worth learning. I went a step further, as is my habit to always take a different step for better or worse, and these days I toss the chire with little oil and roast in the oven as the first step. Only then do I fry it in very little oil in the Kadhai. Works wonders every time. Well, I mean not exactly same "wonder" as frying in gallon full of oil. And the oily dregs of sugar-salt-pepper are missing. And definitely that more oily chire baja tasted better than this less oily one. But this was one tastes very good too. Only a teeny-tiny bit less good. We will settle for that I say. Toss 3 cups of chire/thick poha/flat beaten rice with 1 tbsp of Vegetable oil. Next spread them in a layer on an oven safe tray and bake in the oven at 300F. After the first 7-8 minutes, take it out and toss it around. Pop in the oven for next 7-8 minutes. keep a watch to see that the chire is not getting brown and burnt. Now heat 2 tbsp of oil in a small kadhai. When the oil is hot add about 1/4th cup of peanuts and fry till light brown. Remove the peanuts and keep aside. To the same oil, add a cracked red chilli and a small piece of ginger julienne. Add the crispy baked chire gradually, tossing it in the oil. Sprinkle little salt while tossing. The chire will puff up a little more. After the last step, where you have poured out the chire and added salt/pepper etc., add a fist full of grated coconut and about 1/2 tsp of sugar to the piping hot chire bhaja. Toss quickly and eat. 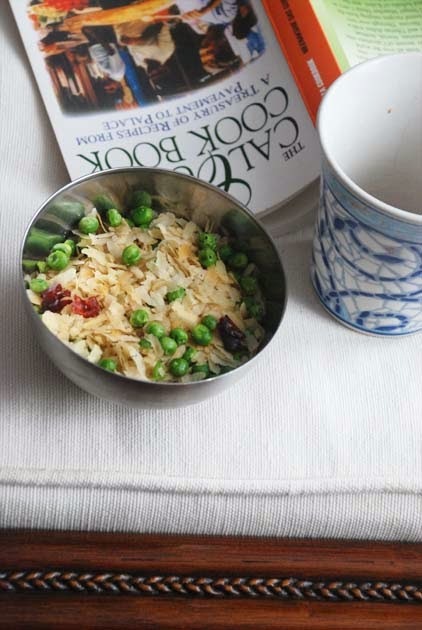 Option 3 -- Koraishuti diye Chire Bhaja or Crispy Poha with Green peas. If using fresh peas, then shell and boil the peas till tender. If using a bag of frozen peas, then microwave the peas till just done. I love these sweet peas ad so we will be generous and use 1 cup of cooked peas. Now heat 2 tsp of oil in a small kadhai. When the oil is hot add a cracked red chilli and a small piece of ginger chopped in julienne. Now add the cooked peas and toss with salt and black pepper powder. Saute for a couple of minutes. Take out the peas and keep aside. Add about 2tbsp oil to same kadhai and heat. Add the crispy baked chire gradually, tossing it in the oil. The chire will puff up a little more. Now switch off heat and pour out the fried chire in a bowl. Add the sauteed peas. Sprinkle with more salt and black pepper powder to taste. When I was a small child, I did not sing. Rather I assumed that "I cannot sing". It must have been a true assumption since years later when I tried to sing lullaby to my daughters, they protested and later told me to not sing when they are trying to sleep! However my father, like all fathers, did not believe in my lack of singing talent as a 5 year old. He was a connoisseur of Rabindra Sangeet and though he himself could not sing a single note in key, he made it up by being an ardent listener. Rabindra Sangeet was the only music that played in our house in those days. The few Hindi songs that I heard were either over the neighborhood loudspeaker or on Binaca Geetmala on Bibidh Bharati. The only voices that boomed through our tape recorder was that of Debobroto Biswas, Suchitra Mitra and Kanika. This overdose of Rabindra Sangeet at home, made me kind of detest Tagore's Songs. Yes, a blasphemy, but honestly I did not get most of the Tagore songs as a child. There were few like "Purano sei diner kotha" and "Aakash bhora surjo tara" which I really liked but most others, played day in and day out sounded monotonic to my ignorant ears. As a result when my Father wanted me to learn Rabindra Sangeet, as most Bengali Fathers would, I protested. I said "I cannot sing", which might have been true but not something that could not have been worked on with some training. But I steadfastly refused any training and even with an opportunity to learn at Tagore's ChitraBhanu, I did not succumb to the pleasures of learning music. Even at the compulsory music class in school, I mouthed words, keeping my voice low, assuming that I cannot really sing. Many, many years later, I kind of started appreciating Tagore's songs. I partly understood the words, the poetry and the music or at least I thought I did. My understanding was not even close to my Father's love for Tagore's songs but at least I realized why he might have wanted me to learn Rabindra Sangeet. So, as most Bengali Mothers are wont to do, I enrolled my daughters in a Bengali music class. I have always heard that most parents want to fulfill their wishes through their children. I thought it was a selfish thing to want. Now, I know, it is not always so. With their years of trudging through the swirling waters of life, when parents eventually realize what happiness those wishes and trainings could bring, they want to plant a love for that wish in their child's heart. So a parent who dropped out of school makes sure that the offspring gets to finish academics, the one who hardly practiced the piano and wishes she could play music for her own solace persuades her child to practice piano every day and the one who never learned to sing wants her daughters to sing. It is not that we parents want our children to become like us, we think it will do them good to be what we aren't. With that wish in my heart, I suggested gaaner school aka music school to my daughters. Of course my father has been subtly suggesting the same all along.I must say that I was lucky enough to find a music teacher in my neighborhood, who is not only fantastic but also knows how to work with kids very well. So once a week, after school, in the evening, she fills my daughter's life with music they don't hear everyday.She teaches them children's songs along with Vedic songs often interspersed with Rabindra Sangeet. The result is that both LS and BS look forward to their Friday Bangla Gaaner school where they go along with little friends they have known since birth. For this Saraswati pujo, their music teacher has taught them Tagore's "Modhuro Dhwoni Baaje". And when these little kids sing this difficult Bengali song, pronouncing the words just right, my heart is filled with an unknown happiness. My Dad was in tears hearing their rendition which I had sent him over e-mail.After all they are little kids, growing up far from Tagore's land and probably do not understand meaning of half of the words of this song. Their singing is not perfect but it is beautiful. For my father, it is probably a wish come true. Now back to this very Bengali Mutton Stew which LS loves. BS too loves the stew as long as she does not have to eat the mutton. She is turning into a vegetarian these days. In winter vegetables like carrots and beet makes this the perfect winter stew. Usually I make the stew this way. But this time I followed the recipe for Leela Majumdar's "Brown Stew" narrated in her inimitable style, from her cookbook which I read more for the comfort it brings than recipes. This is truly the most heart warming soup you can make, with minimal effort on your part. It tastes best with mutton but is good enough with chicken too. 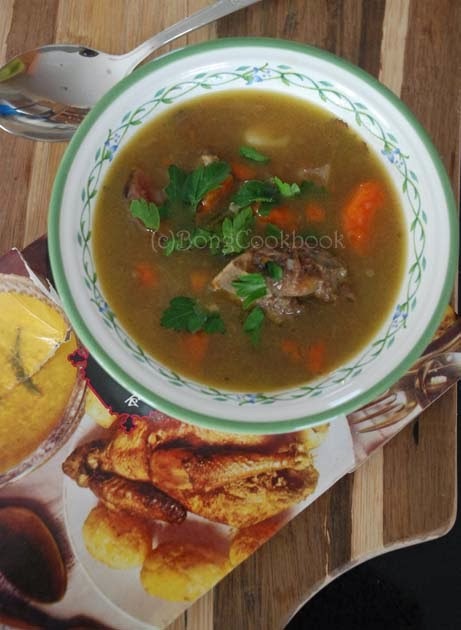 As the author says, do not overload this stew with vegetables. 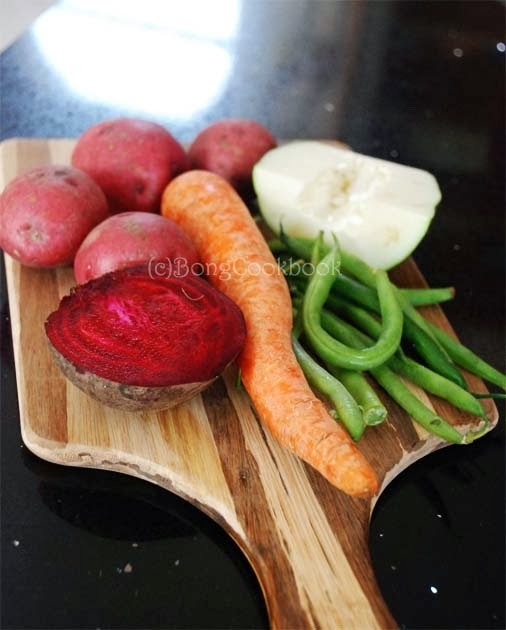 The vegetables should be in proportion with the meat you use. When the whole spices sputter, add the mutton pieces. The pieces should be in a single layer and not crowd the pan. Saute at high heat until the mutton pieces are browned. 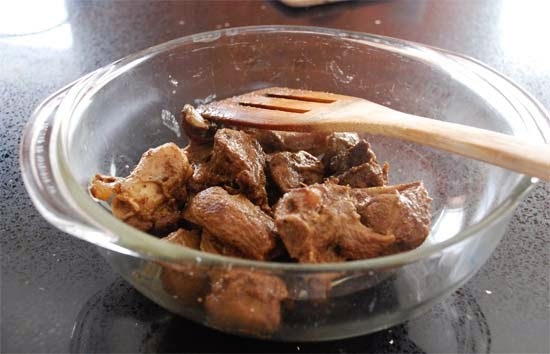 If the mutton releases water, cook until the water is dried off and the mutton has lost its raw coloring. Take out the mutton and keep aside. 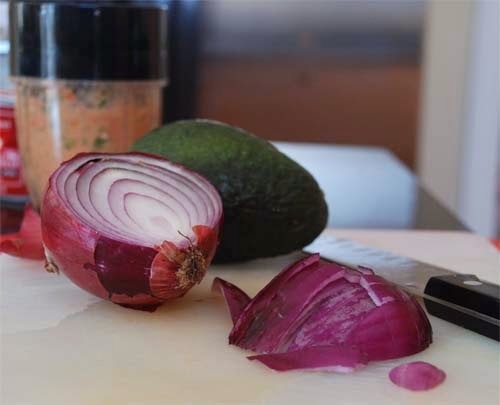 To the same oil, add the onion and fry for 2-3 minutes until onion softens a little. 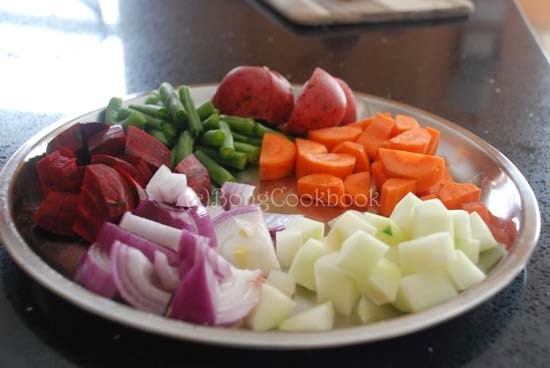 Add all the other chopped vegetables, sprinkle salt and let the vegetables brown a little. 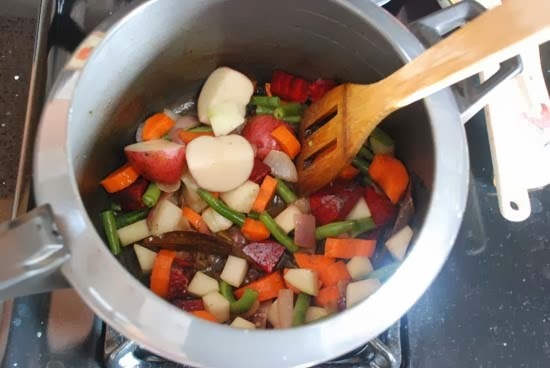 It is not really necessary to fry the vegetables, just gently saute for a few minutes. Now add the browned mutton pieces. Add about 5 cups of water, salt to taste and mix everything with a ladle. 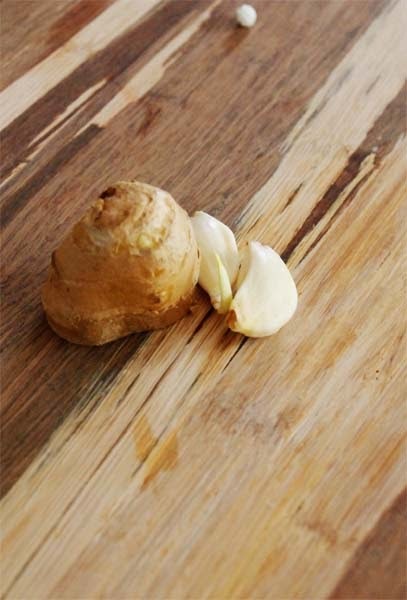 At this point add 2 fat clove of garlic chopped in slices and an inch of ginger grated. Let the stew come to a simmer. Close the pressure cooker. After the first whistle or once the pressure is built up, lower the heat and let the stew cook at low medium heat for about 10 minutes. After that raise the heat and cook for 5-6 more minutes. Switch off and let the pressure cooker release steam naturally. Once the pressure cooker lid can be opened, carefully open the lid and check if meat is done. If not, you have to close the lid and cook for another 6-8 minutes. If the meat is done, taste the stew and add cracked black pepper and salt to taste. If the stew looks a bit runny, open the lid and put it on heat again to cook off some of the excess water. Serve with a dollop of butter and with a piece of crusty bread or rice on the side..